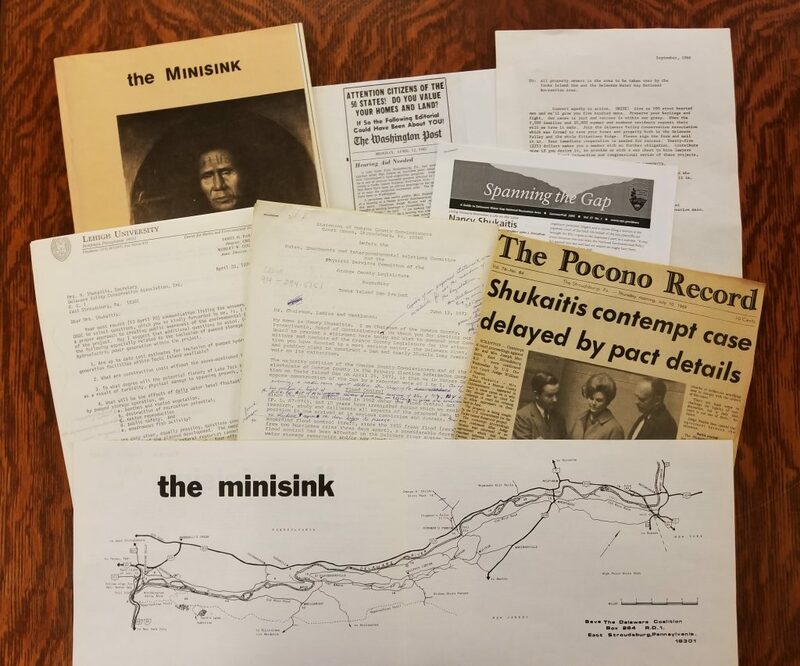 Editor’s Note: Housed at Lehigh University, the Nancy Shukaitis papers provide insight into the roles of women and indigenous peoples in the Philadelphia area conservation and environmental movements. A housewife catalyzed by federal threats to raze her home, Shukaitis found herself linked to Native Americans’ long history of displacement. How are some of the least-expected populations moved to resistance and to building coalitions? What are the issues that link people of different backgrounds? Collage of materials relating to the opposition of Nancy Michael Shukaitis to the Tocks Island Dam. Lehigh University Library. In the 1960s, the United States federal government planned the construction of the Tocks Island Dam. The construction plan aimed to build a 37-mile barrier beyond the shores of the Delaware River to be utilized for drinking water, hydroelectricity, and flood protection. Congress and the four governors of the states belonging to the Delaware River Basin Commission — Delaware, Pennsylvania, New Jersey, and New York — made up part of the large support network for the dam proposal. Despite the dam’s numerous projected benefits, it posed serious issues for many people. To construct the dam, the government planned to use eminent domain to acquire the property of approximately 1,200 people living in New Jersey and Pennsylvania. Nancy Shukaitis was among the people who lost her land, but she refused to fade into the background while the government displaced people from their homes. Instead, she dedicated her time and efforts to fighting the Tocks Island Dam project as well as opposing industrial and commercial development initiatives of the natural land. Shukaitis did not evoke the typical image of resistance in the 1960s. When the government developed the Tocks proposal, Shukaitis was a housewife. Her empathy and investment in the community sparked an activist’s spirit, despite it not being a traditional role for married white women with young families at that time. She began organizing by informing the public of the controversial nature of the project and promoting water conservation. 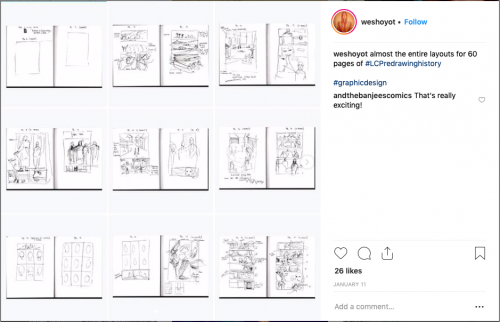 She raised awareness through various platforms: corresponding with local, state, and federal political officials, holding public meetings to spread the word, and writing to newspapers. As she became more invested, Shukaitis worked in several environmental protection groups such as the Delaware Valley Conservation Association, Save the Delaware Coalition, and Lenni Lenape League to further raise awareness surrounding the Tocks Island Dam and water conservation. Environmental impacts of the dam were nebulous at best. Several locations along the Delaware River were considered for construction, yet serious problems arose at each point. Because of unideal geological formations for hydroelectricity, the U.S. Army Corps of Engineers planned to destroy large scenic mountains in the Delaware Water Gap. Sediment accumulation threatened larger floods at the site of the dam. There was no guarantee water purity would be maintained, despite a prime incentive of building the dam being the exportation of water to Philadelphia and New York. Moreover, a large portion of the land to be flooded was home to priceless Native American artifacts. 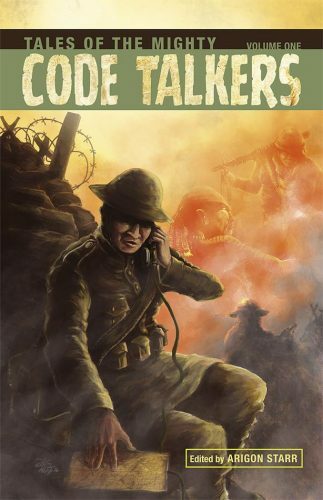 The dam’s threat to destroy Native American artifacts motivated Native Americans to build coalitions with Shukaitis. The Lenape, also called the Delaware People, were indigenous to the proposed area. They protested the construction of the dam for over three decades to preserve their land and artifacts. 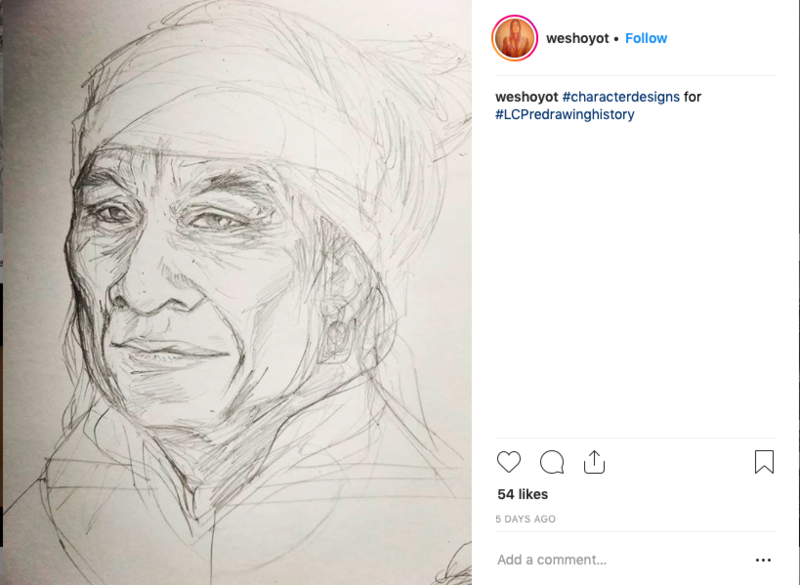 Born in Smithfield, PA, in an area called “Shawnee on the Delaware,” and as a member of the Lenni Lenape League, Shukaitis’s local identity gave her another angle from which to combat the proposed construction. 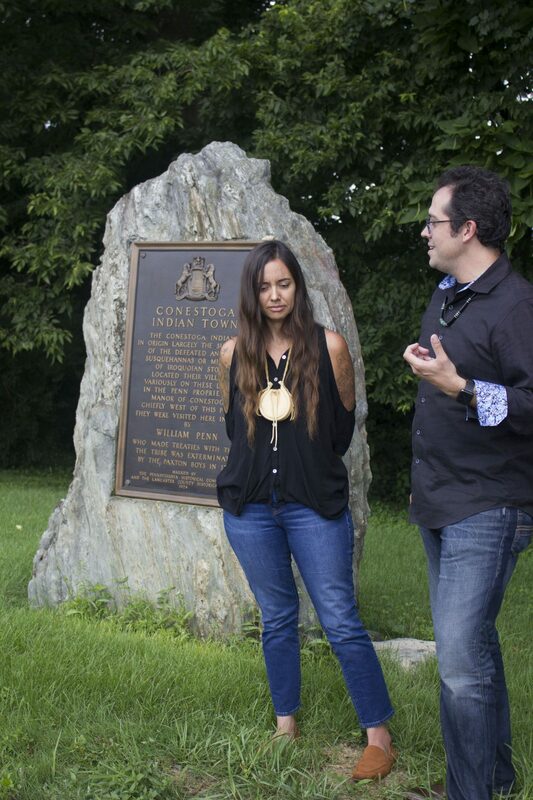 She joined the efforts of the Lenape Indians to protect the land and objects belonging to their ancestral roots. 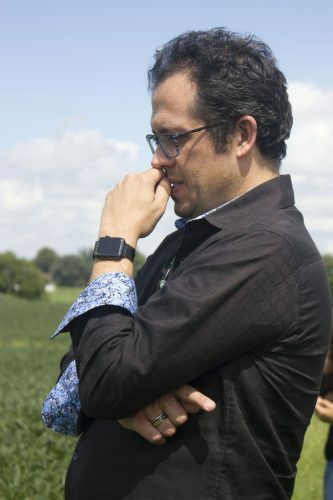 Many asked Shukaitis why she had not stepped aside and let her husband take over the project. That option had never crossed her mind. Shukaitis and her activist colleagues gave testimony to the U.S. Congress in 1965 and succeeded in preventing development of 70,000 acres. On September 1, 1965, Congress established the land as the Delaware Water Gap National Recreation Area to manage lands surrounding the proposed Tocks Island Dam. 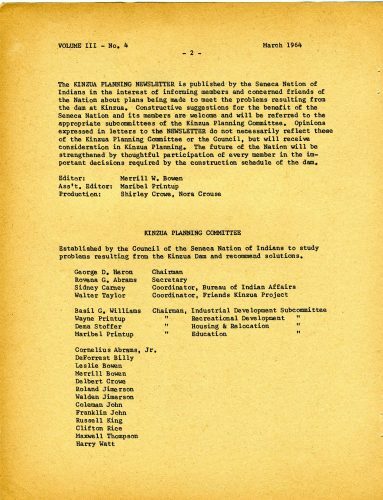 Nonetheless, for several decades, various interest groups continued efforts to claim the land. As the first woman elected commissioner of Monroe County in 1967, Shukaitis was able to stop the construction of a luxury hotel soon after the land was protected. In 1978, Congress established the Middle Delaware National Scenic River, which blocked the construction of future dams. Congress formally de-authorized the Tocks Island proposal in 1992, but threats to the land continued. In 2011, PPL Corporation proposed a $1.2 billion power line project through the park. Long retired from politics, Shukaitis helped citizens sue to protect the land and succeeded in preventing the project. Nancy Shukaitis’s acts of resistance protected a scenic landmark from destruction, and her efforts can be appreciated more today than ever before. In the middle of the twentieth century, the impact of dams was not completely understood. Today, time and research have enabled society to understand that dams can irreversibly alter ecosystems and wipe out local species. Thus, while Shukaitis protected land that formerly belonged to her, she also helped maintain the harmony and ecosystem of the area in general for decades to come. Her persistence in activism on behalf of her community has inspired several generations, and she is still honored by local environmental and political foundations. The Kinzua Dam on the Allegheny River in Western Pennsylvania was formally dedicated in September, 1966. Intended for flood control and power generation, the dam and the reservoir it created led to the displacement of 160 Seneca families from their ancestral lands and the condemnation of 10,000 acres of land on the Allegheny Reservation. The United States recognized these lands as part of the Seneca Nation through the signing of the 1794 Treaty of Canandaigua, or the Pickering Treaty. The Kinzua Dam was a direct violation of this treaty. 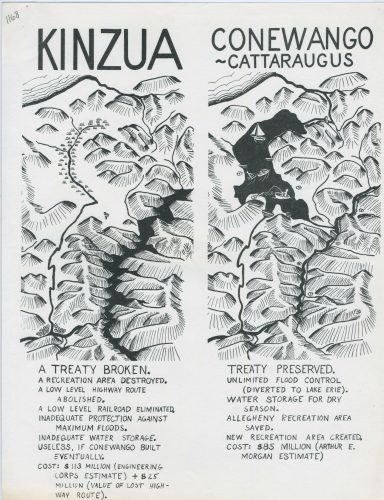 Advocates of Native rights, environmentalists, and social activists banded together to oppose the Kinzua Dam, or to promote alternative strategies and locations such as the Conewango-Cattaraugus project. 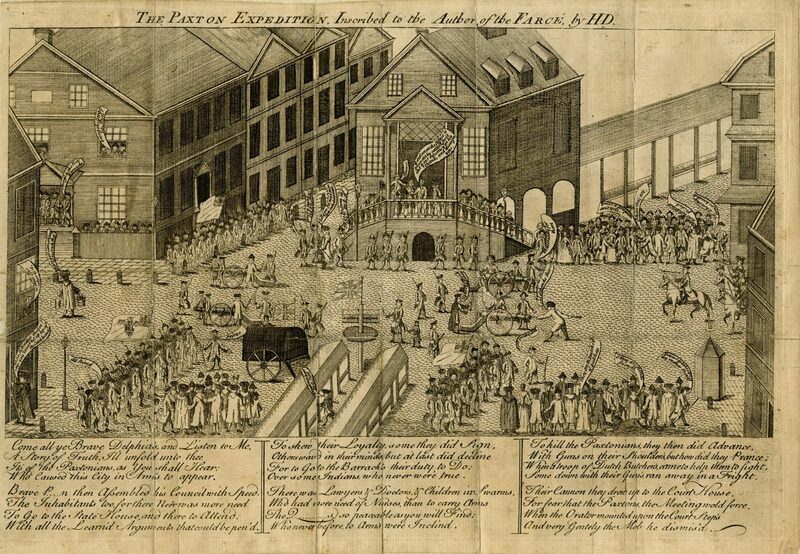 Quaker & Special Collections at Haverford College has extensive documentation of this activism and protest in the papers of Theodore Hetzel, a Quaker involved with the Philadelphia Yearly Meeting Indian Committee. Philadelphia Quakers had a long relationship with the Seneca dating to the 18th century, and were present at the signing of the Pickering Treaty. During the fight against the Kinzua Dam, Philadelphia Quakers lobbied representatives in Washington, worked with Native leaders, and helped to publicize the issues surrounding the dam. 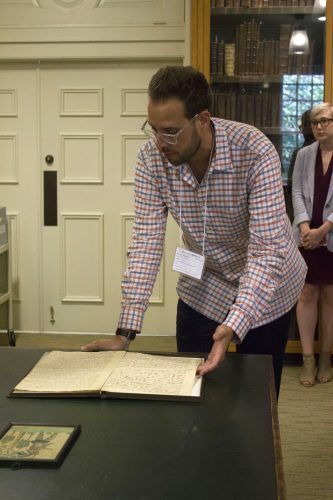 Although many of the materials in Hetzel’s papers come from and represent the voices of the Quaker community, there are also materials which document Seneca voices. 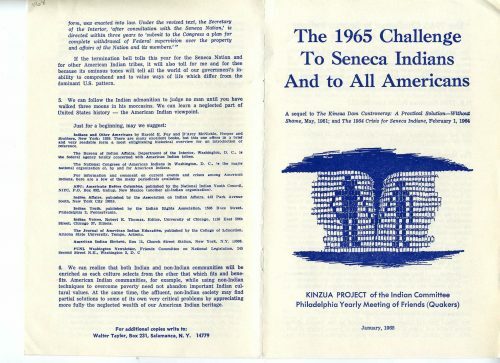 These include letters from Seneca leaders, newsletters published by the Seneca Nation, and news stories which include Native voices. 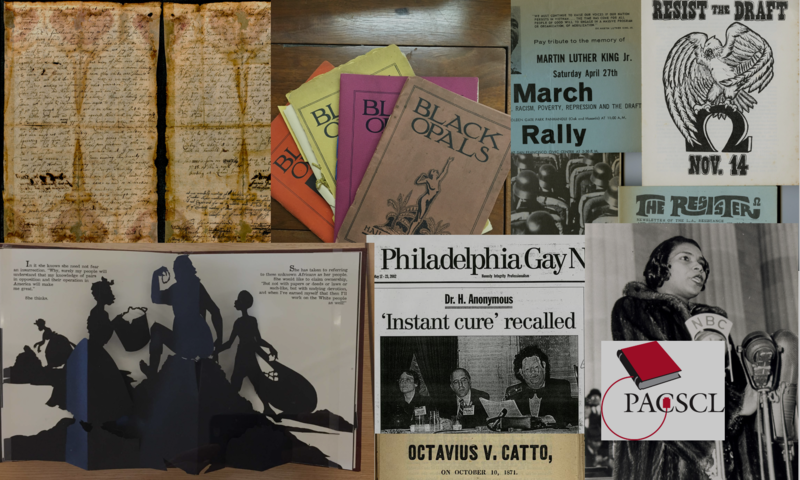 Other materials include photographs, letters from politicians, news reports and letters to the editor, and documentation of actions carried out by Quakers. While the efforts to stop the Kinzua Dam were ultimately unsuccessful, they provide important documentation of a struggle which is not obvious to those familiar only with the dam itself, and not its history. Choosing lots of new houses for those displaced by the dam at the Seneca Nation offices. 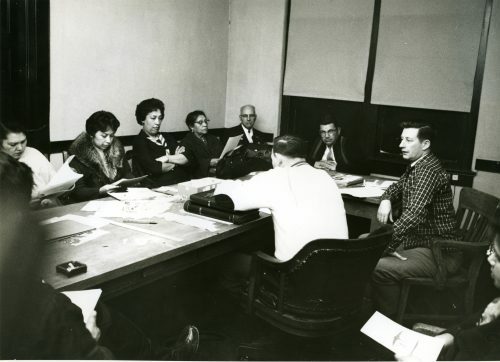 Those pictured include Jessie Snow, Dorothy Jimerson, Bob Haines, George Heron, Kenneth Snow, and Walt Taylor. Courtesy Haverford College Libraries.